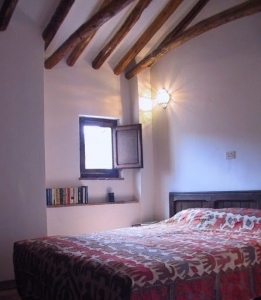 CASA MORISCA: SLEEPS 6 and has tiled floors, shutters, exposed beams, an open patio, roof terrace and many original features. It has been lovingly architect restored with local materials in traditional colours. It has thick walls with small windows and traditional shutters keep it cool and shaded in summer and with a log-burning stove cosy for winter. 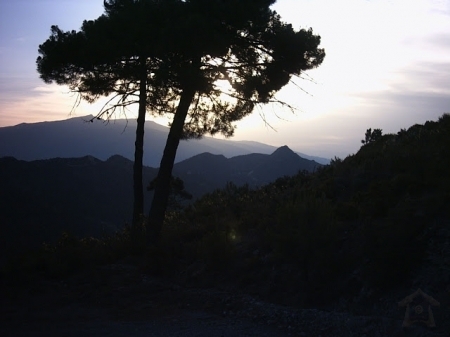 Perfect base for WALKING and EXPLORING Granada and its province and skiing just one hour away. DOWNSTAIRS, around an open patio with fountain and flowers – lounge with arab style banquettes around a log burning stove, excellent kitchen; dining room; open patio, barbecue; double bedroom, en-suite shower. ROOF TERRACE with wonderful views views across the river gorge to Giralda, 1431m, in the Sierra de las Guájaras. 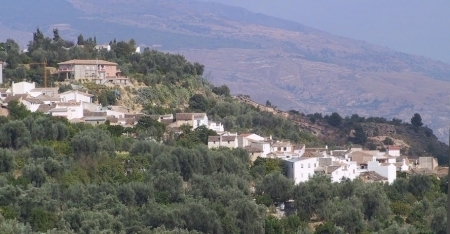 ALBUNUELAS is an old Andaluz pueblo blanco, a village of white houses, lying at 737m, at the head of the Lecrin valley, on the steep side of the Rio Santo gorge, beneath the Sierra de Albunuelas which rises to 1504m at Herrero. With open country all around it has within WALKING DISTANCE shops, a bank, a choice of bars, a restaurant and a weekly market. The house is down in the heart of the old village, enclosed in Moorish style by other properties; but its second floor terrace gives a wonderful view over the roof tops. It also looks down into the inner patio with its barbecue, flowers and a fountain. 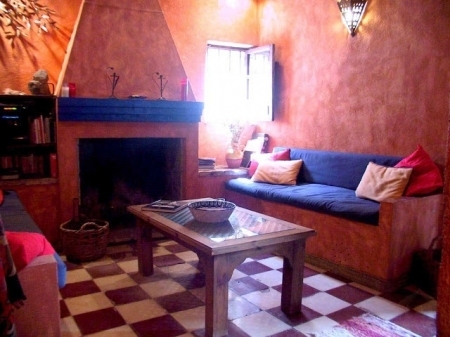 Through the front door of Casa Morisca, a traditional lounge with arab style banquettes and fireplace with woodburning stove is on the right and to the left a modern kitchen. This leads into the open patio, which lights the dining room and a double bedroom which has a shower and wc en-suite. There is the sound of running water throughout the house from the fountain in the patio as well as a centuries old fountain in the downstairs suite, which still supplied water to the previous occupants. On the first floor are the master bedroom with king size bed, a twin bedroom, a bathroom with full size bath and a study. Above is a roof terrace with a view of the mountains, perfect for breakfast or a G&T as the sun goes down. Just one hour to the SKIING and a season December to May make this an ideal base for mixing a couple of days on the slopes with other activities and for groups with some non-skiiers. DISCOUNT 24 euros for couples using only one bedroom. DISCOUNT 100 euros per week for additional weeks. LONG or SHORT stays - add/deduct price per night [one seventh of additional week rate]. Verdant and well irrigated since the time of the Moors, it grows a wealth of oranges, lemons, pomegranates, avocados, mangoes and vegetables - with almonds and olives, and pines covering the higher slopes. Something is being harvested at all times of the year. Midway from the City of Granada to the coast at Salobrena, its lake Beznar is fed by the melting snows of the Sierra Nevada. Unlike the adjacent Alpujurra it remains hidden from the influences of tourism, but with Granada half an hour and the others less than an hours drive, it is an ideal centre. Its history goes back to the beginning of the millennium when Albunuelas was on the routes of al Idrisi, the first arab geographer, and of Leon el Africano who travelled from Timbuktu to Granada. Many of the Albunelenses still farm the surrounding terraced campos and can be seen commuting in the mornings by mule with tools, and dogs - even a goat - and returning laden later. They may travel for an hour to get to their patch, which could be up the far side of the gorge. There are three bridges over the river Santo and an extensive network of mule tracks up the hillside and a number of unmetalled forestal tracks, which give tremendous scope for walking and mountain bikes. Caballo at 3013m stands to the east of the valley and is capped in snow until well into spring after the almond blossom has fallen. 35 km from Granada [30 minutes], bus service, 40 km Granada airport [35 mins] 120 km Malaga airport [90 mins] 450 km Madrid airport [4hrs 30min] - offers cheaper flights when holiday airports like Malaga raise prices at school holiday periods. 40 km to the sea [45 minutes] 65 km to skiing at 2200-3300m [1 hour] Unlimited choice of walking from the door. Available in all seasons. People with LIMITED MOBILITY would be better suited by our other property, Casa Molino, ref 84429, which has all facilities on one floor and private parking at the door. Lets can be for any number of days and start on any day of the week. The house will be available for you from 4pm on day of arrival and you should vacate by 10am on departure. The price includes meeting and greeting and handing over keys up to 11pm. There will be sheets and towels and facilities to wash these during your stay. A normal cleaning at the end of your visit is included. Our agent can arrange additional washing/cleaning and late arrival at extra charge. Also included are linen, towels, logs, gas and electricity. The price is for the number of people stated and pets are not permitted. LONG or SHORT stays - add/deduct NIGHTLY RATE [shown above] from week rate [one seventh of additional week rate]. Midway from the City of Granada to the coast at Salobre�a, its lake Beznar is fed by the melting snows of the Sierra Nevada. Unlike the adjacent Alpujurra it remains hidden from the influences of tourism, but with Granada half an hour and the others less than an hours drive, it is an ideal centre.